Happy Halloween! Here are some Halloween-themed quotes from Diana Gabaldon's books and stories. Hope you enjoy them! 6) Even wee Jemmy is affected by stories of "things that go bump in the night". He was tall, and he was naked. Beyond a breechclout, he wore nothing but paint; long stripes of red down arms and legs and torso, and his face was solid black, from chin to forehead. His hair was greased and dressed in a crest, from which two turkey feathers stiffly pointed. I didn’t dare to move. My breath sounded painfully loud in my ears. He simply stood there, perhaps a dozen feet away, and looked straight into the dark where I was, as though it were the broadest day. And the light of his torch burned steady and soundless, pallid as a corpse candle, the wood of it not consumed. I don’t know how long I had been standing there before it occurred to me that I was no longer afraid. I was still cold, but my heart had slowed to its normal pace, and my bare toes had uncurled. “Whatever do you want?” I said, and only then realized that we had been in some sort of communication for some time. Whatever this was, it had no words. Nothing coherent passed between us--but something passed, nonetheless. 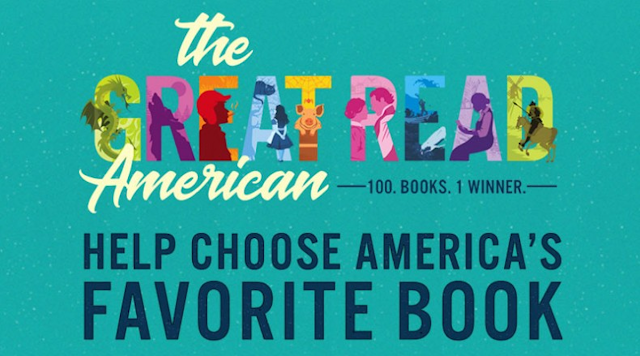 OUTLANDER took the #2 spot in the Great American Read contest on PBS! 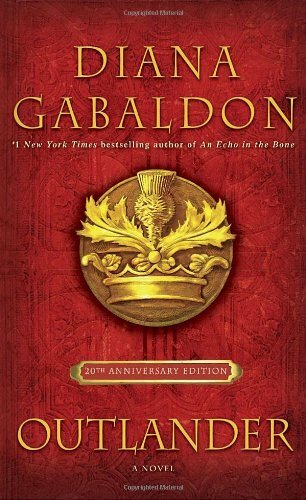 Congratulations to Diana Gabaldon!! Here's her reaction to last night's show, and the results. I was delighted that the show included both a brief interview with Diana and a look at OUTLANDER fandom. And OUTLANDER beat J.K. Rowling, Tolkien, and Jane Austen, which is a pretty impressive feat! You can see the full list of 100 books here. In case you missed the broadcast, you can watch it here. VOYAGER 25th Anniversary Edition is now available! The 25th Anniversary hardcover edition of VOYAGER is now available! 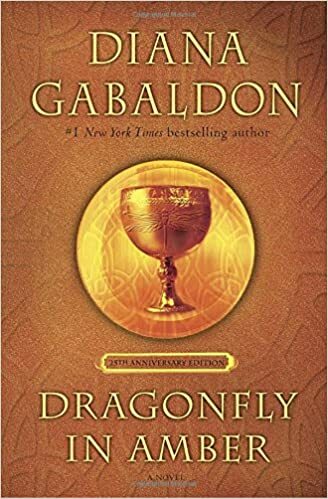 This book is similar to the Anniversary Editions of OUTLANDER and DRAGONFLY IN AMBER (pictured below) -- deluxe hardcover editions, complete with "faux-leather" binding and a ribbon bookmark -- and I think they'll look terrific as a matched set! If you'd like an autographed copy, you can order from the Poisoned Pen bookstore in Arizona. This is Diana Gabaldon's local independent bookstore, and they ship all over the world. Wishing a very happy 100th birthday (believe it or not!) to our favorite time-traveling Sassenach, Claire Elizabeth Beauchamp Randall Fraser! She was born on October 20, 1918. If you're on Twitter, please tag your tweets today (October 20th) with #Sassenach100. In celebration of Claire's centennial, here are some of my favorite "Claire moments" from the OUTLANDER books. It wasn't easy to pick just one per book, but I tried to choose quotes that highlight the many different aspects of Claire's personality. I hope you enjoy them! If you haven't read all of the OUTLANDER books, you will find spoilers below! Read at your own risk. “I’ve a mind to take you up on it,” I said. “However ...” I glanced through the screen of branches toward the house, which was clearly visible. The trees were beginning to leaf out, but the tiny sprays of tender green were by no means sufficient camouflage. I turned back, just as Jamie’s hands descended on the swell of my hips. Events after that were somewhat confused, with the predominant impressions being an urgent rustling of fabric, the sharp scent of trodden onion grass, and the crackling of last year’s oak leaves, dry underfoot. My eyes popped open a few moments later. He grinned down at me, stepping back and letting his kilt fall into place. His face was flushed a ruddy bronze with effort, and his chest heaved under his shirt ruffles. He grinned maliciously, and wiped a sleeve across his forehead. “You won’t live that long! Come here!" What about the rest of you? Do you have a favorite Claire quote, or scene, from the books or show? What is it about Claire that makes her such an amazing character? 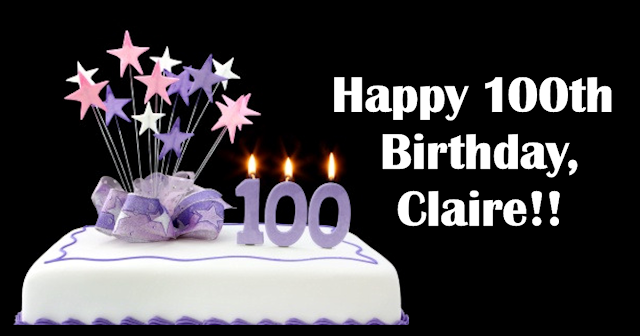 Happy 100th Birthday, Claire! Many thanks to Diana Gabaldon for creating such an unforgettable character, and to Caitriona Balfe for bringing her to life on TV! Looking for a way to pass the time while we wait for Season 4 to start? Here's something I think many of you will enjoy. Saeed Jones is a new fan who has just discovered the OUTLANDER TV show, and has been live-tweeting his reactions as he binge-watches the series. He's hilarious! If you're on Twitter, you can follow him at @theferocity. 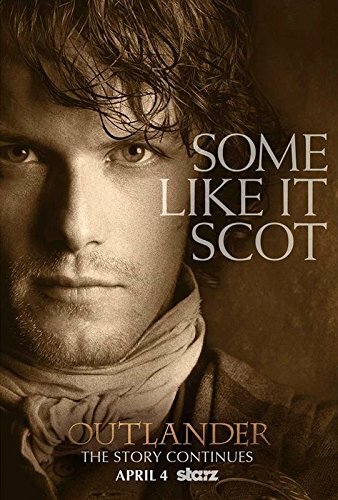 DRUMS OF AUTUMN TV tie-in paperback is now available! The STARZ TV tie-in paperback edition of DRUMS OF AUTUMN is now available! Like the previous STARZ tie-in editions, this paperback features the actors from the TV series on the cover, but the text of the book has not changed. If you'd like an autographed copy, you can order from the Poisoned Pen bookstore in Arizona. The Poisoned Pen is Diana Gabaldon's local independent bookstore, and they ship all over the world. 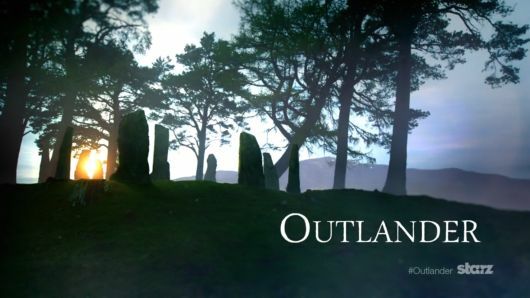 STARZ has posted the new opening title sequence for OUTLANDER Season 4! As usual, they've changed the music somewhat, to give it a more Southern/Appalachian sort of feel. It's going to take a little time to get used to the singer's attempt at a Southern accent, but I'm really much more interested in the images. The shot of the gorgeous North Carolina scenery at the end made me go, "Ooooohhhh!!" and immediately put me in a good mood. Then I looked closer, and what I saw made me like it even more! 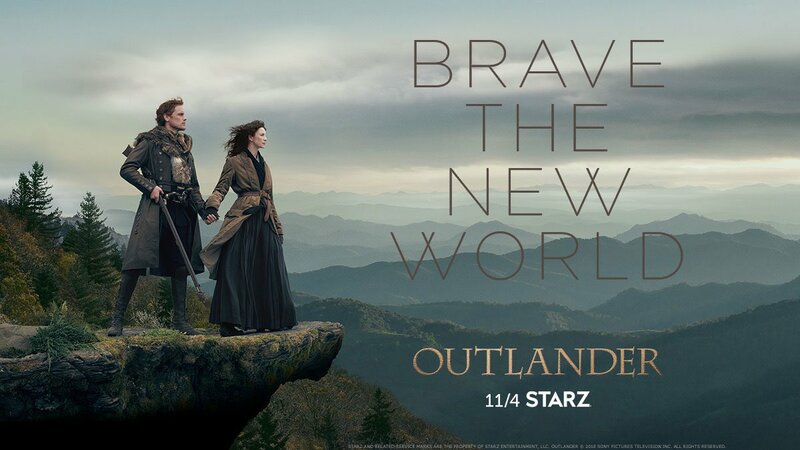 If you look really closely at the view of Fraser's Ridge at the end, you can make out Jamie and Claire in the center of the shot, looking out over the ridge, Jamie's arm around Claire, and Claire leaning in affectionately toward him. I like that a lot, as a sort of evolution of the famous shot of the two of them riding across the Scottish landscape from Season 1. I'm interested to hear what the rest of you think of the new opening sequence. OUTLANDER is on the cover of this week's issue of Entertainment Weekly magazine! The special issue features a look at OUTLANDER Season 4, including a photo shoot with Sam and Cait. From their clothing and the background in some of the shots, this seems to be Jamie and Claire at Jocasta Cameron's plantation, River Run. Talk about giving a misleading impression of what Season 4 will be all about! Of the three covers shown above, I like the first one (with the two of them together) the best. On the other hand, I was really struck by the lifeless expressions on Sam and Cait's faces in many of these photos, as if to say, "We've spent the entire day posing for this ridiculous photo shoot, we're tired and bored, and we want to go home!" I'm kind of underwhelmed, but that's all right. I don't think the diehard fans are the target audience for these covers. The EW people who put this photo shoot together are trying to sell magazines and/or get clicks for their website, and to that end, they'll do whatever they think will appeal to casual readers/viewers, whether it bears the slightest relationship to the actual contents of Season 4 or not. At least they got to keep their clothes on for these pics, unlike the very controversial EW cover which some of you may remember from 2016. Which new character are you most looking forward to seeing in Season 4? Less than five weeks to go now until OUTLANDER Season 4 premieres! Which NEW character (excluding Jamie, Claire, Roger, Brianna, etc.) are you most looking forward to seeing in Season 4? There are number of very important characters that will be introduced this season, and I'm excited to see all of them. Please take a moment to vote in the October poll on Outlandish Observations. If your most-anticipated character isn't listed, you can always vote "Other" and write him/her in. Thanks!